First 4 Print Finishing has consolidated the First 4 brand by renaming its Vitesse Mailing Preston subsidiary First 4 Direct Mail, aligning Vitesse closer with its parent company. Blackburn finishing specialist First 4 Print Finishing acquired the Preston-based polywrapping business last summer, as it sought to satisfy demands for polywrapping from customers of its paper enclosing services. First 4 took on all of Vitesse’s 50 staff and its 2,800sqm factory. Since then it has added a fifth CMC polywrapper to the plant and moved all its existing direct mailing kit from Blackburn over to Preston in a move to concentrate all DM activity on one site. As well as buying Vitesse, First 4 also purchased its own existing 4,650sqm plant in Blackburn, taking its total investment to £1.5m. At the time, First 4 managing director David Nestor said that Vitesse had “a very good name” that would be maintained “for the time being at least”. But in the past few months the newly unified company carried out extensive research among its staff, customers and suppliers and concluded that a single brand name would be the strongest way to communicate with stakeholders going forward. The two companies will now sit side by side within a group structure. 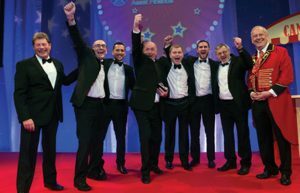 Nestor told PrintWeek that the group had just embarked on a programme of investment that would continue throughout the year. “We’re not only going to be investing in the plant but we’re going to be investing in people as well, bolstering the management team going forward,” said Nestor. The group’s current turnover is £5m with First 4 Direct Mail’s circa £1.5m. Across the group there is 150 staff, 100 in Blackburn and 50 in Preston. The multi-award winning First 4 claims to be the UK’s fastest growing trade finishing company.